Situated on the picturesque Prestwick promenade is this substantial 4 apartment ground floor flat. The accommodation is accessed via private entrance and extends to hallway with space for workstation/study and large storage cupboard, spacious bay fronted lounge with uninterrupted views over the Firth of Clyde to the Isle of Arran, two bedrooms (one double, one single), a modern shower room and a good sized kitchen with dining recess area leading to walk in pantry. The flat is set within attractive gardens with private front garden and private small walled garden to rear. Lock up garage and further parking bay and side gate access directly onto the promenade. The property is located within a highly sought after residential area of Prestwick within easy access of the town which offers a wide selection of good quality local shops, bars & restaurants. Prestwick railway station is also a short stroll from the apartment and offers regular services to Glasgow. From our office on Prestwick Main Street proceed north on Main Street turning left at the traffic lights at Prestwick Cross. 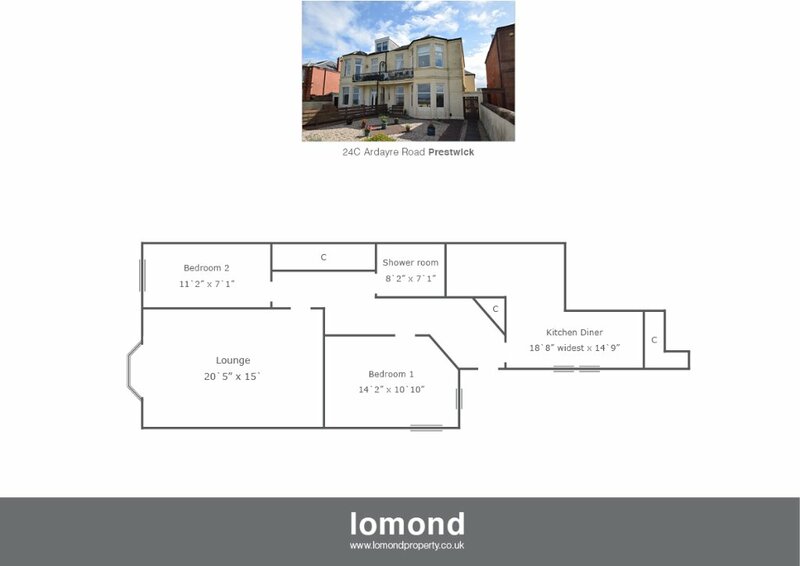 Proceed under the railway bridge onto Links Road and take second left onto Ardayre Road where the property is located on your right hand side. EPC rating: C. Letting Agent Registration Number: LARN1812039.